Nokia has admitted that its budget Lumia 610 device just isn't powerful enough to run the Windows Phone Skype app and has stopped further downloads. The manufacturer had initially allowed Lumia 610 owners to download the free VoIP app when it launched a month ago, despite the handset only boasting half of the memory required to run it. The Lumia 610 has just 256MB RAM, while Skype claims that a minimum of 512MB is necessary to effectively power the app. Naturally Nokia's test-run didn't work out too well. The manufacturer says that although Skype was functional on the device, but the performance did not match either company's standards. A translated statement from the Finns says: "Nokia attaches great importance to the launch of products and services to bring the user experience, so even if the Skype Windows Phone version on the Nokia Lumia 610 does, but after intensive testing, we found the user experience does not guarantee to Nokia and Skype the expected level. "Therefore, we do not recommend users to use Skype on the Nokia Lumia 610. Nokia Lumia 610 users in the Windows Phone Marketplace will not be able to download Skype, Windows Phone version. Skype, Windows Phone version will continue to open to other users to download." 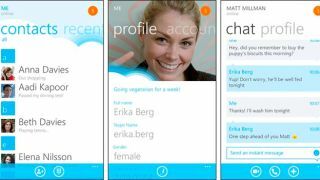 The Skype app was a latecomer to the Windows Phone party, despite the company being under Microsoft's control. When it finally dropped the Beta tag last month, Skype wasn't exactly met with universal approval despite its highly attractive and original UI. Among the many complaints, users were upset that the app does not allow background calls, meaning calls can only be received with the app running in the foreground.